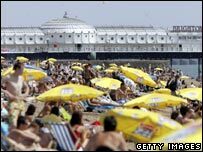 Britons are set to spend a total of £97.3bn on holidays this year, according to a survey by Axa Insurance. The study looked at all aspects of holiday costs, such as hotels, car hire and travel insurance. The cost of booking holidays will total £45bn, while holidaymakers are set to get through £29bn of spending money and will fork out £7bn on new clothes. Trips in the UK and Republic of Ireland were the most popular, attracting 22.4 million people, the study says. In second place was Spain with 12.2 million UK holidaymakers, followed by France in third place with 8.3 million. The next most popular destinations were Italy, the US, Greece, Canada, Portugal, Australia and New Zealand. Axa said 50% of Britons took between one and three holidays a year, while one in 10 treated themselves to four or five breaks. In addition, it found 2.1 million people had more than five holidays a year.